Basic Training Teacher, DEC and BEC posts. Out of 13634 posts 13222 vacancies for BTT, 29 Posts for DEC and 383 posts for BEC allotted. Eligible candidates can submit applications online @www.erdo.in on or before 18/10/2018. This Basic Training Teacher, DEO and BEOs recruitment 2018 of ERDO will be conducted on basis of merit only. Currently these vacancies are available in the districts of Bihar only. 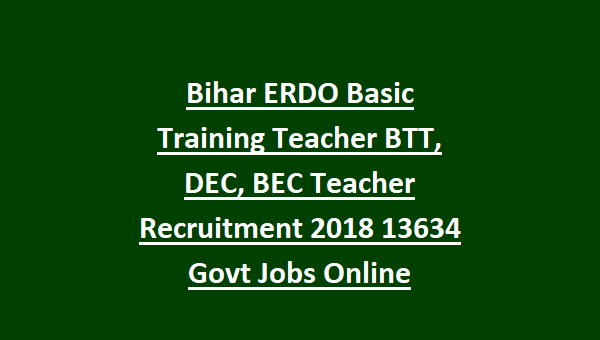 For the available vacancies, selection process, important dates, age limits, required qualification, and how to apply online details for ERDO BTT(Basic Training Teacher) DEO, BEO (Block/District Educational Controller) general recruitment 2018 information is given below. 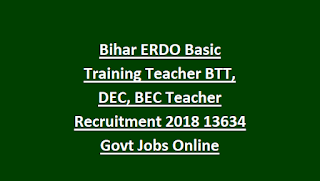 Click here to see the official notice of ERDO BTT (Basic Training Teacher), DEO, BEO (Bock Education Officer) Recruitment. This recruitment for the Basic Shiksha of Science, Mathematics and English teachers recruitment. All the posts are 11 months contract basis only for the academic year 2018-2019. Merit list will be available in erdo.in website. For BEC Rs.18450/- per month. For (BTT) Basic Training Teacher-The candidates must have qualified Degree from recognized institutions only. Those candidates who are having B.Ed, B.PEd, BTC, DEd, JBT, NTT, PPT will be preferred and for these candidates 25% seats are reserved. District Education Controller(DEC)- M.Ed, MA Education, M.Phil and Ph.D candidates are eligible. For all the posts SC/ST/OBC candidates 5 years of age relaxation is applicable. For Basic Training Teacher Jobs-Degree qualification required. 25% of vacancies are reserved these qualifications having candidates. For DEC Posts -PG qualification is required. 50% vacancies are reserved for MA Education, M.Ed, M.Phil & Ph.D having candidates. Selection will be held based on merit in 10th class, Intermediate, Degree and other qualifications. Based on merit list candidates will be called for documents verification. For DEC & BEC posts General and OBC candidates examination fee is Rs.600/- and for SC/ST Rs.400/-. For Basic Training Teacher posts General and OBC candidates examination fee is Rs.450/- and for SC/ST Rs.250/-. Application fee has to be pay through the Pay U Money Payment Gate Way only using Debit or Credit Card or using net banking. The candidates have to apply through online via the official portal of ERDO @www.erdo.in only. Before applying read the user instructions and official notification. Click here to apply online for the ERDO Basic Training Teacher, District Education Officer, Block Education Officer Recruitment 2018. Written Test T-TET (Teacher Training Eligibility Test) will be conducted for 100 marks only with 100 questions and each question carries 1 mark. T-TET will be conducted in English and Hindi languages and objective type multiple choice test. ERDO T-TET (Teacher Training Eligibility Test) Qualifying marks are 50% for General and OBC candidates and for SC/ST candidates 45% only.